Grafting is the process by which a fruit tree is asexually propagated resulting in a new young tree, which will be genetically identical to the parent tree. It is a common but mistaken belief that apple seeds collected from a particular variety can be planted to produce an exact genetic copy of that variety. 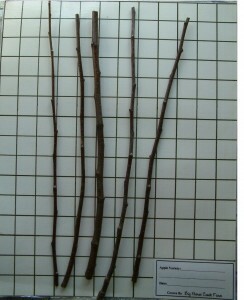 To reproduce an exact copy of any selected apple variety, it must be spring grafted or summer budded. At Big Horse Creek Farm, we utilize the technique of dormant spring grafting which we conduct in March and April. A shoot or twig (known as a scion or scionwood) is collected in January or February and stored under refrigeration until grafting season. The process of grafting itself is quite simple. A selected piece of scionwood is inserted into the rootstock of a young apple tree where, over time, it will heal and fuse together to produce a new tree. We carefully nurture this young tree over the summer so that by the fall planting period we will have a strong, healthy one-year-old tree ready for you to put into the ground. The most important point in collecting scionwood is to be sure to collect new growth; that is, twigs or shoots that emerged the previous summer. New growth is identified by its smooth, reddish or greenish bark in contrast to older growth which will have rough, grayish-colored bark. New growth will have small, tight buds and rarely have side limbs, twigs or branches which are common on older growth. The two photographs on the left show examples of good and bad scionwood. Notice in Fig.1 the relatively smooth cuttings with small buds. This one-year-old wood is excellent grafting material. 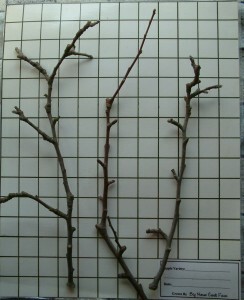 Fig.2 shows two and three-year-old fruiting wood which is unsuitable for grafting. However, the cutting in the middle of Fig.2 shows a short length of wood at the top which is good viable scionwood. Frequently on older trees this is the best material that can be collected. On older, unmanaged trees, new growth may be difficult to find. Normally, this new growth can be found out on the tips of twigs high up on the sunny side of the tree. You can also find new growth on “water sprouts” which are vigorous, whip-like shoots ranging in size from a couple of inches to several feet in length and typically found growing vertically upwards from the trunk or larger limbs. Not all water sprouts are new growth, however. Be sure that any water sprout selected for scionwood has no side branches or twigs. Collect the proper scionwood cuttings in late January to mid February. The cuttings should ideally be eight to ten inches in length and approximately the diameter of a pencil, although pieces of a smaller length and diameter can be successfully grafted. Bundle the scionwood together and label each variety separately. Wrap the bundles in a damp (not wet) paper towel and enclose tightly in Saran Wrap or a plastic bag. Pack the cuttings inside a cardboard tube from a roll of paper towels or in a padded envelope purchased from the Post Office. To ensure quick delivery and pick-up of your cuttings, mail them by US Priority Mail to the address below and, if possible, notify us by email that they are on the way. (It is not necessary to ship using the more costly First Class or Express Delivery.) Include a note in the package identifying who you are, what you want grafted, rootstock preference (if any) and how many of each you would like to have grafted. If the material is healthy, viable scionwood, we will graft the trees in the spring as described earlier and contact you in the fall when the trees are ready to be shipped. If you have any questions, Contact Us. Thank you.